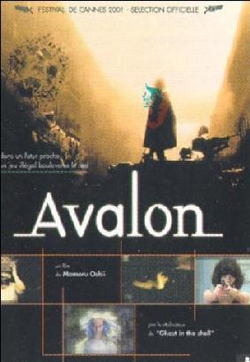 Avalon is a Japanese Science fiction film from 'Mamoru Oshii,' the director of the hit Anime movie 'Ghost in the Shell.' It shares similar themes as the Wachowski bros' 'Matrix' trilogy but is a far more accomplished film than all three movies in that franchise. It's clever and subtle. Intriguing and very thought provoking. It is not, however, for everyone. It's excruciatingly slow pace, sparse dialogue, Difficult theme and intense plot, will mean many people will turn off 10 minutes into the movie. If however, like me, you love clever movies which both test your mind and leave you thinking about the movie long after the credits roll. Avalon is for you. In fact. All the players of 'The Game' treat it like it's their entire life. Only one goal, one question, is on Ash's mind. What is class real? And can 'Bishop,' a new character that has just appeared in the game, give her an answer. I really don't want to give away any more of the plot as I fear it would detract from your enjoyment of the movie. So i'll start to talk a little about the production aspects. Firstly. The movie was made in Poland. In Polish. With an entire Polish cast. I'm not exactly sure of Oshii's intention here, but the setting does allow the movie to take on a really cold and mundane feel. The Polish dialect is also very stand offish and further heightens the sense of loneliness and isolation of the real world. Secondly the special effects are in a class of their own. Whether Ash is taking on tanks, Hover ships, running through explosions, whatever. Everything is done in a way to enhance the film. Not eclipse it. The look of the film is also extremely surreal. With nearly each and every scene altered into a marvellous sepia tone 40's postcard effect. The acting is hard to judge. All the actors are Polish and, like I said before there is not much dialogue or interaction between characters. You just have to accept everything as it is. No one said this was an easy film to watch. You have been warned. And so what is the purpose of this film? What is it trying to say? Well, the movie never quite gives you all the answers. Even down to the very 'Open' end. What it does however, is make you think. The players of the game treat it as their life. It's more rewarding and gratifying than anything they accomplish in the real world. And is there a surprise in store within class real? Well, the name itself should give you a hint. But you wont understand this film that easily. I have watched it over 5 times and still noticed something new each time. You'll know already if this is your type of film, and I honestly can't recommend it to anybody else. I did warn you. But I think it's 1000 times better than 'The Matrix Re-Bloated'. Neo Comments: GUESS WHAT? THIS IS IT! Let's celebrate and yeah and yeah. One is probably asking like this: ??? why the hell are we meant to celebrate? Well, the fact is that this is in fact the site's first ever!!!!!!!! Anime review! Yup I am on a high, cos personally I do love animes, especially Japanese ones, they are classics, well at least the ones I have been watching, but somehow, Seraph finds a way to review movies and even animes that I have not watch, so mate - well done and good job and keep it up! Cheers everyone!